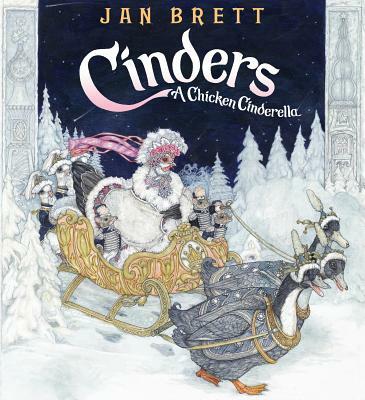 Jan Brett sets her Cinderella story in a snowy Russian winter where one magical night, Cinders, the most picked upon hen in the flock, becomes the most loved by Prince Cockerel when she arrives at his ball looking so beautiful that even her bossy sisters don't recognize her. Jan travelled to Russia and readers will be in awe of the Ice Palace aglow under a deep blue moonlit sky, exquisite ball gowns on the comely pullets, uniforms with gold braids and buttons on the cockerels, striking Russian architecture transformed into ice in the borders, and a very funny flock of chickens who provide an appealing, original look at this snowy Cinderella. Readers will find these dressed up chickens comical as they pour over the extravagant setting, including a "WOW"-inducing double gatefold of chicken couples whirling around the ballroom. A feast for the eyes sure to become a perennial favorite. Jan Brett (www.janbrett.com) is the beloved New York Times bestselling author/illustrator of many books for children. She lives in Norwell, Massachusetts, where she raises show chickens and has more than seventy chickens living at her home.